No Nee to Register on the Day go Straight to the Start Line! On the Day Entry is Available but are No Medal Places, Please go to the Help Desk near the Start/Finish Line from 7AM to Enter on the Day. All Finishers Receive a Bespoke Medal, Goody Bag & Free Unlimited Digital Photo Downloads. Marathon Winning M/F - £?? 2nd Place M/F - £?? 3rd Place M/F - £?? Half Winning M/F - £?? Half 2nd Place M/F - £?? Half 3rd Place M/F - £?? 5k Winning M/F - £?? 5k 2nd Place M/F - £?? 5k 3rd Place M/F - £?? Finisher Shirts & Hoodies are Available to Purchase at Registration Charged at £12 for Technical Shirt and £24 for a Hoodie. At the Finish you Receive a Unique to that Race Bespoke Disco Medal, Goody Bag and Free Unlimited Photo Downloads from Mick Hall Photos (Paid by Time2Run Events). The Main Cafe will be Open All Day for Breakfast & Lunch, There will Also be Outdoor Catering. If you would Like a Stall at the Registration Area Please Contact Us. Will be Posted out to You so Runners can go Straight to the Start Line No Need to Register on the Day! Your Race Pack will have Final Instructions Enclosed & Chip Race Number! Follow Signage to Car Park from Adbolton Lane Saturday and Sunday then Signage to Registration. Day Parking is Available at a Cost of £5 Per Car on a New ANPR System Managed by Serco who Manage the Country Park. Time2Run Take No Financial Gain from the Car Parking and is Completley Managed by the Landowners. A Bag Drop Area is Located at the Registration Area, Baggage is Left at your own Risk and is Sometimes Not Manned. Please put your Own Labels on any Baggage with Name and Race Number on. On Course Portable Toilets Every 2.8 Miles Located Near the Feed Station and also Near the Boat House. The Route is on Pedestrian Paths Sections, We will Allow 1 Ear Headphones, Please Keep to the Right Hand Side and Allow Fast Runners to Pass you on the Left. 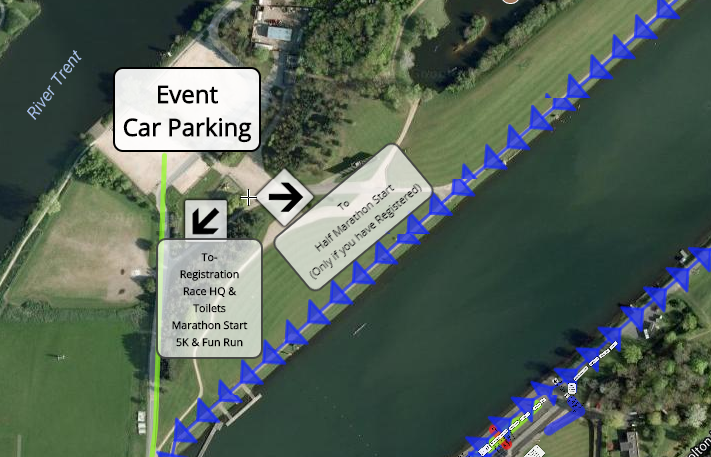 PLEASE NOTE THE HALF MARATHON IS 1.4Mile From REGISTRATION! A Feed Station will be Placed at Least Every 2.8 Miles. It will be Stocked with Cup Water, Electrolyte Drink, Various Sweets, Chocolate & Cake. You can also Leave Personal Nutrition at the Feedstation.